On the table in less than 20 minutes, this is the perfect quick meal. 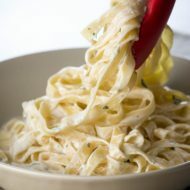 No need to order take-out when you can whip up this scrumptious dish in no time. 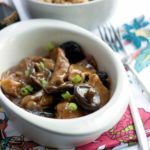 This recipe for chicken with Chinese mushrooms is so good and authentic; your guests will think it came from a Chinese restaurant! I recently discovered a Chinese grocery store in my town. I love cooking homemade Chinese food, so I just had to stop in. They had an amazing selection of dried mushrooms that I’ve seen in restaurant food but have never seen in the grocery store. The mushrooms I chose were called black mushrooms. They looked like the ones I see most often in Chinese dishes. 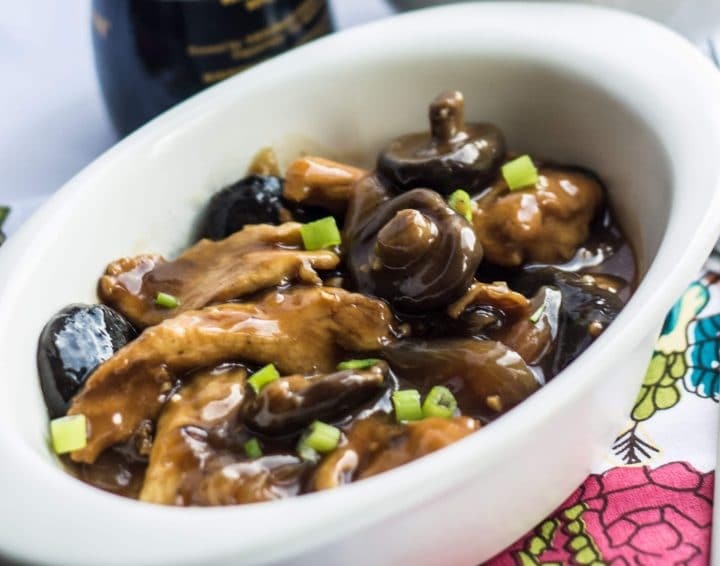 One of my favorite dishes from my local Chinese restaurant is Chicken with Chinese Mushrooms. Its made in a deep-flavored sauce I just had to try to replicate and I have to say, I came really close! 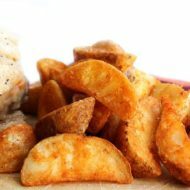 This is a fantastic recipe that is super simple and tastes amazing! You can’t order takeout in the amount of time it takes to make this dish! 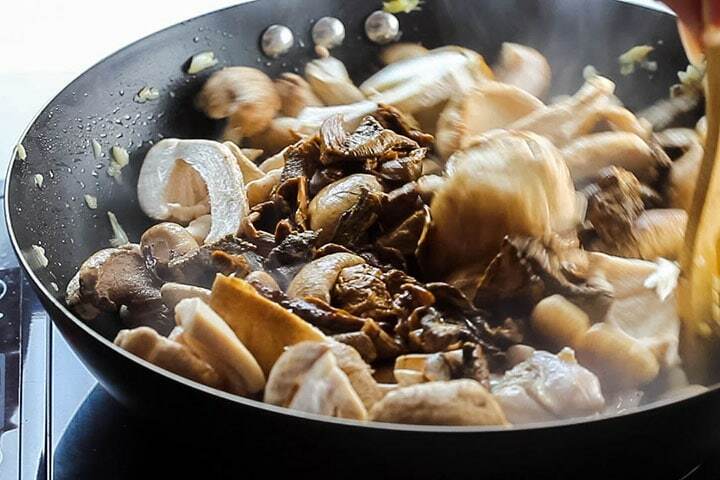 Adding the liquid from the soaked mushrooms is the perfect natural flavor addition to the sauce. 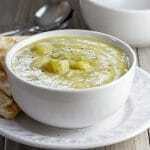 The recipe uses either fresh or dried mushrooms making ingredients readily available. 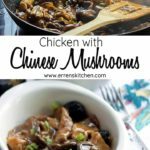 When I first created this recipe, I made it exclusively with dried Chinese Mushrooms. 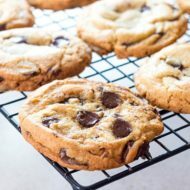 It tasted great, but I wanted to use ingredients that are easily found. So, I added a mixture of dried and fresh mushrooms to show that if you can’t find dried Chinese mushrooms, it’s not the end of the world. I went with dried shiitake mushrooms instead of actual Chinese mushrooms because they are not only easy to find, but they are absolutely delicious and fit the bill wonderfully. I chose to let you choose the cut of chicken you like best. I chose thighs because I feel dark meat chicken is more flavorful, but white meat is preferred by many. It’s your choice. I have to admit that dried, these mushrooms don’t look too appetizing. 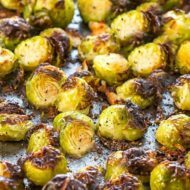 Believe me, once they are re-hydrated they are packed with flavor and become the star of the dish! During my shopping, I also picked up some Chinese rice wine (get it here on Amazon), which I’ve been wanting to buy forever! Wow, it adds such an authentic flavor! If you’ve never tried it – I highly recommend it for your Asian dishes. 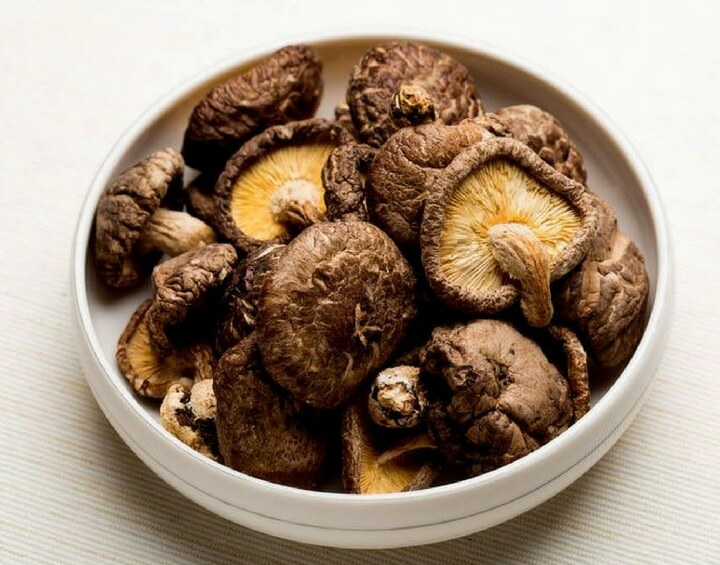 In a small bowl, soak the mushrooms in boiling water for 20 minutes or until they become tender. 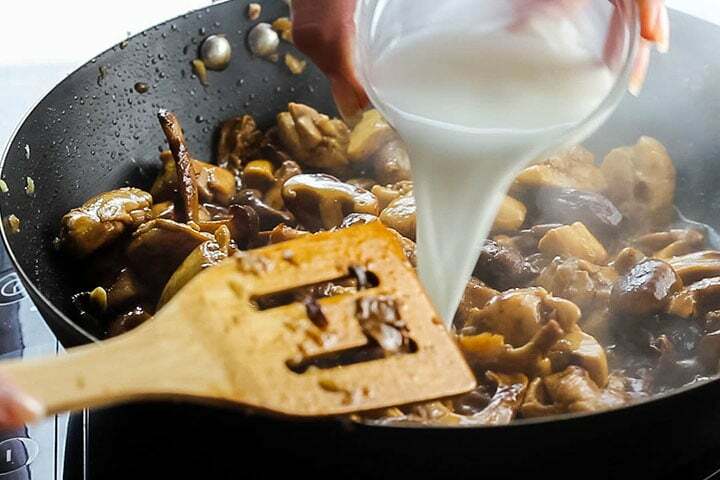 Once re-hydrated, Remove the mushrooms with a slotted spoon and squeeze out any excess liquid. Reserve 1⁄4 cup of the liquid and set aside. 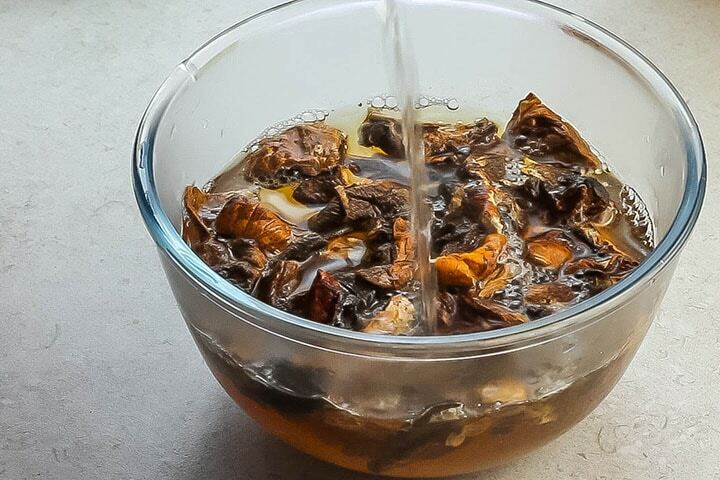 This makes is the mushroom stock. Heat a wok over medium-high to high heat. 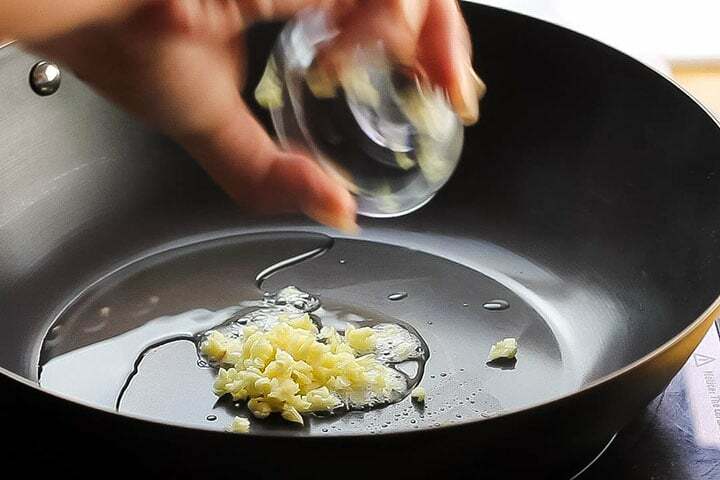 Add 2 tablespoons of oil to the heated wok and add the garlic. Stir-fry for about 30 seconds. Add the chicken. Stir-fry until the pink on the outside is no longer visible. Cook until tender and the liquid they release cooks down. Add the soaked mushrooms. Stir-fry another 2 or 3 minutes. Add the oyster sauce, dark and light soy sauce. Add cornstarch mixed with water to thicken. 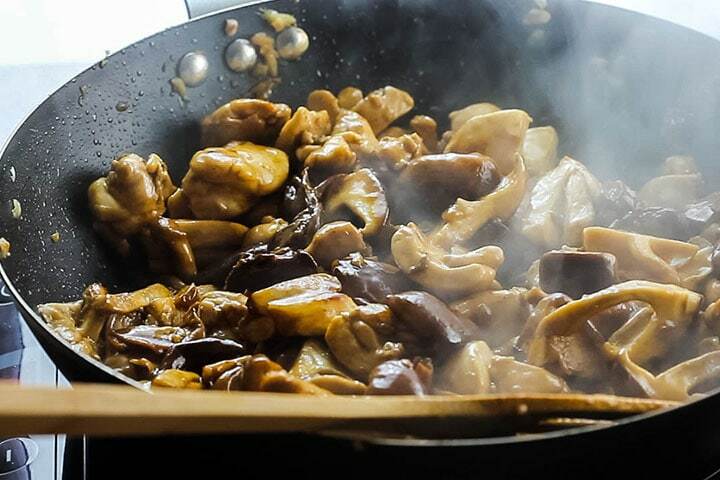 Bring to a boil and stir-fry until the mushrooms are coated and the sauce has thickened (another 2 or 3 minutes). 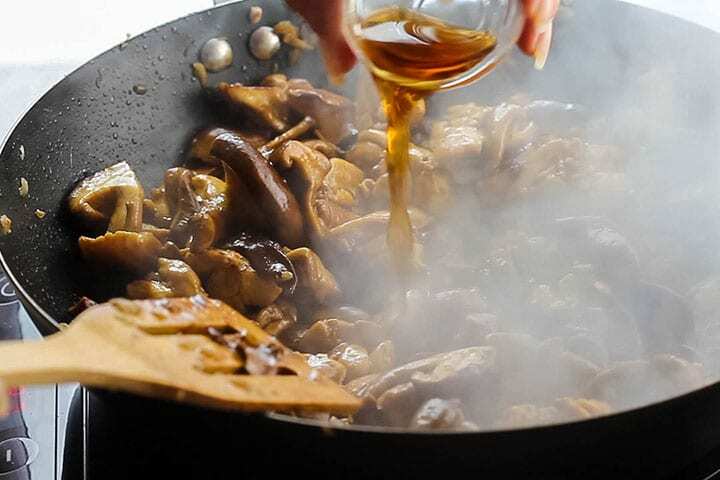 Stir together with the chicken, mushrooms, and thick luscious sauce. If you can’t find dried mushrooms, the fresh shiitake mushrooms work great on their own. Having trouble finding Chinese rice wine? You can replace it with dry sherry (which until now, I have always used in my Chinese cooking and it works really well). 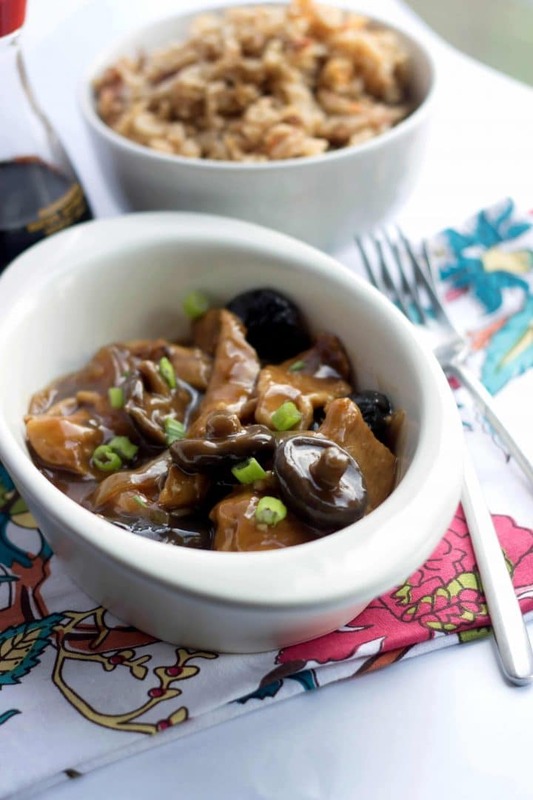 Need an alternative to oyster sauce? 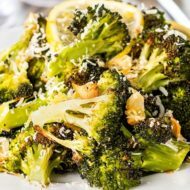 Try using hoisin sauce or teriyaki sauce. Both are great options. 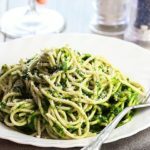 Need an alcohol free recipe? Just use the mushroom or chicken stock instead. I like to keep the mushrooms whole, but if they are too large, you can slice them. Cornstarch & water is used to thicken this sauce. 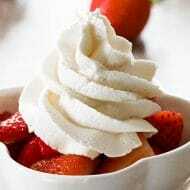 Be sure that they are mixed until smooth to prevent clumping when added. When in doubt, run it through a strainer. 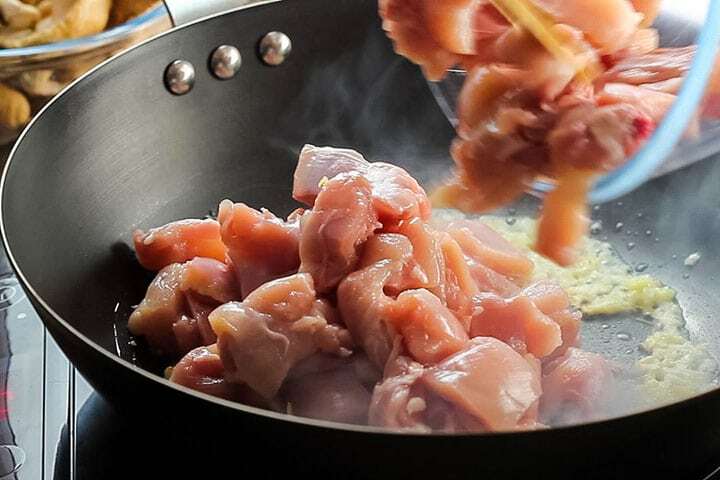 Have your ingredients ready by wok. Having everything ready and close by helps add things quickly, making sure everything is cooked properly. If you have a wok, use it. 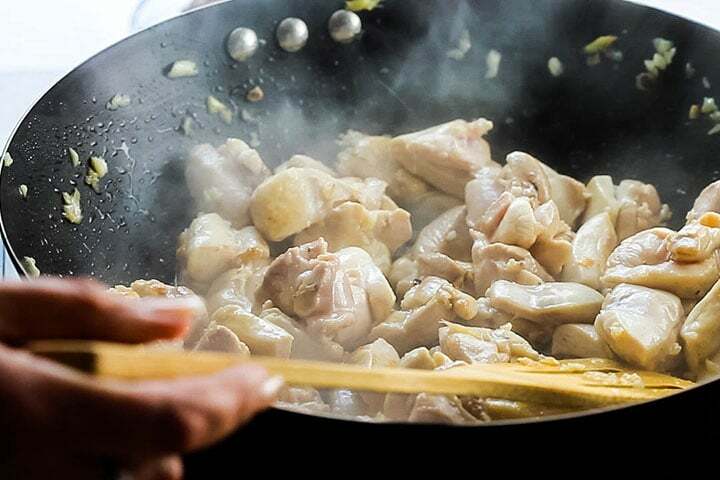 Woks have a large cooking area and retain heat well, making it perfect for stir-fries. Don’t have a wok? 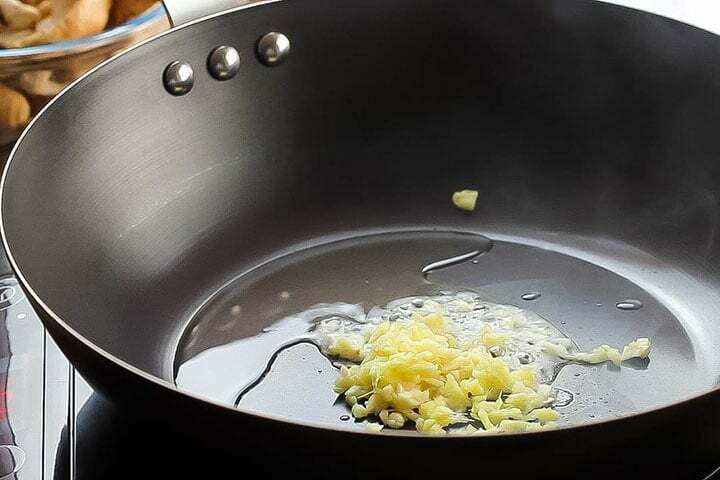 Choose a pan with a large surface area and plenty of space to stir-fry and heat your pan before adding the oil. Heating will help prevent sticking. Serve with a side of noodles or fried rice. Skip the chicken and just add vegetables: bok choy, carrots, and zucchini. 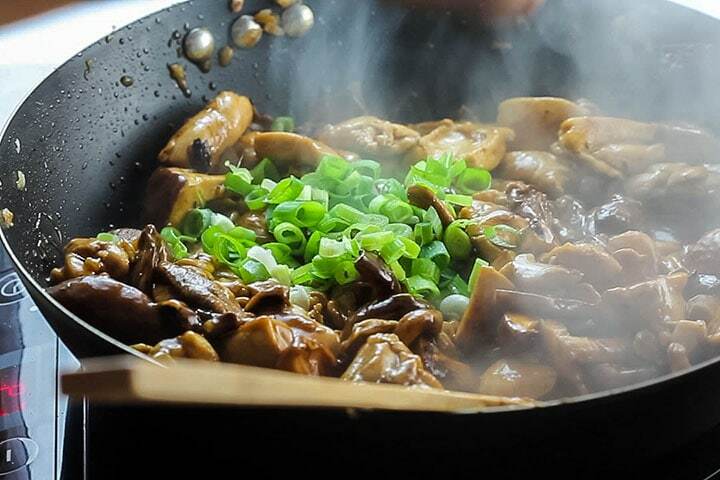 Buy extra dried mushrooms and keep them in your pantry along with fresh garlic, ginger and shallots (they don’t need to be refrigerated) and this dish can be made anytime as a meat-free stir-fry. Just use the shallots instead of green onion and add them at the same time as the garlic and ginger. 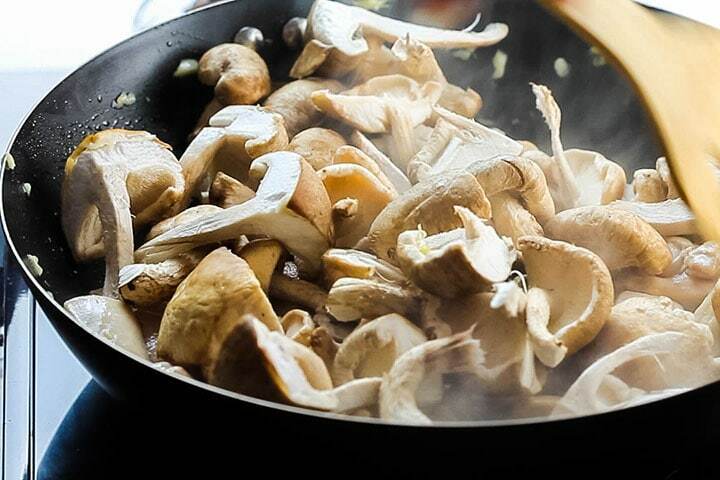 Remove the mushrooms from the water with a slotted spoon and squeeze to remove any excess liquid. Reserve 1⁄4 of the liquid and set aside (this is the mushroom stock). Heat a wok over medium-high to high heat. Add 2 tablespoons of oil to the heated wok. Add the garlic and ginger to the hot oil. Stir-fry for about 30 seconds. Add the chicken and stir-fry about a minute. Add the fresh mushrooms and cook until tender and the liquid they release cooks down. Add the soaked mushrooms and stir-fry another 2 or 3 minutes. Add the oyster sauce, dark and light soy sauce, rice wine or sherry, the mushroom stock, and cornstarch mixture. 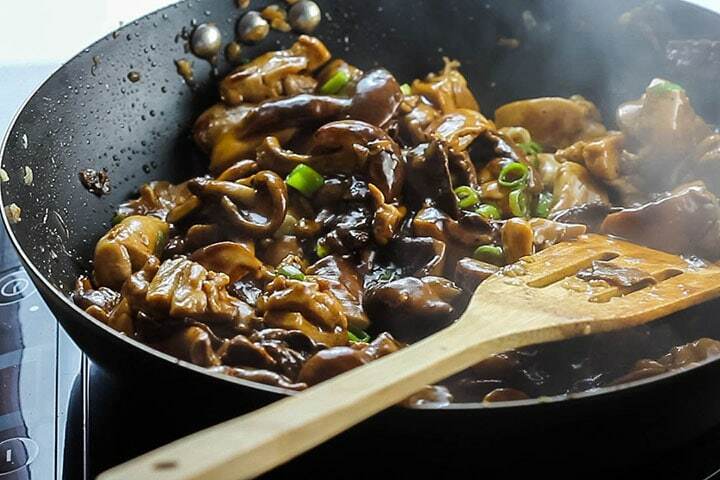 Bring to a boil and stir-fry until the mushrooms are coated and the sauce has thickened (another 2 or 3 minutes). Stir in the green onion. 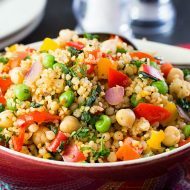 Serve immediately with fried rice or side of your choice. 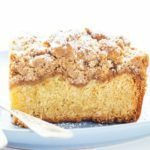 Need a alcohol free recipe? 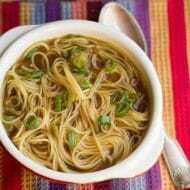 Just use the mushroom or chicken stock instead. 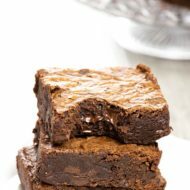 Update Notes: This post was originally published in June of 2014, but was republished with tips, step by step photos, a recipe change, and video in August of 2018. 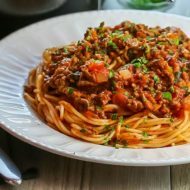 My boyfriend and I love it and I am cooking this dish very often now. That is awesome to hear Medi! Hi Esther Thank you so much for your feedback, I’m glad you enjoyed!